So how did we get on in Gameweek 25? The most important feature of the Dour Midfield is to transfer in premium players, the more expensive the better, exactly on or just after their form is about to drop significantly. This is crucial, as you'll want to achieve as few points in a Dour Midfield as possible so that when you come to sell your players on you'll get a much lower return, as much as -£0.3m in some cases. A perfect example can be seen above, as Leroy Sane has scored 1 point for us within two games. We swapped him in for Eden Hazard, who scored 15 points in just the one game. Now, this is an advanced example, so do not worry if you cannot replicate this in your first go at the Dour Midfield. A good starting option, although he has already fallen in price significantly, is Anthony Martial, who offers you a maximum possible lack of points (0) even when he plays. Do contact us here at Team TSZ with your own attempts at the Dour Midfield, as we may feature your best examples in our coming FPL Podcasts. 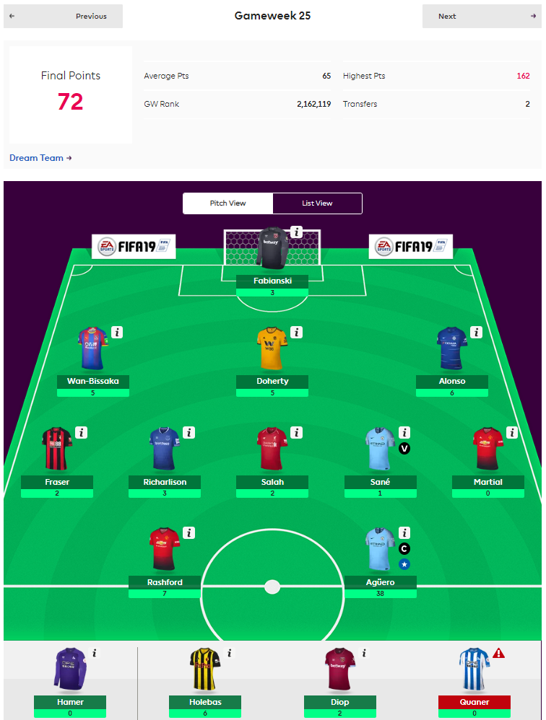 Otherwise, we scored an above-average 72 points, thanks almost entirely to Captain Sergio 'Kun' Aguero. We may not go back for Pierre-Emerick Aubameyang after all. A red arrow despite captaining Aguero is quite impressive, we think! The need to rid ourselves of Manchester City, Chelsea and Everton players for the approaching blank gameweek was the main topic for discussion today. Ironic, really, considering the gang have been banging on about getting City players in for the last month and a half. It took approximately one minute before Rob was the first to sigh and ask when the team were considering a wildcard. We need to go on the offensive, now, was the general consensus, apart from Trystan who hasn’t quite spent enough sleepless nights mulling over every possible angle just yet. The wildcard is coming, but perhaps it is best, Trystan said, to wait until after the FA Cup fifth round; when we’ll know more about upcoming blanks and doubles. 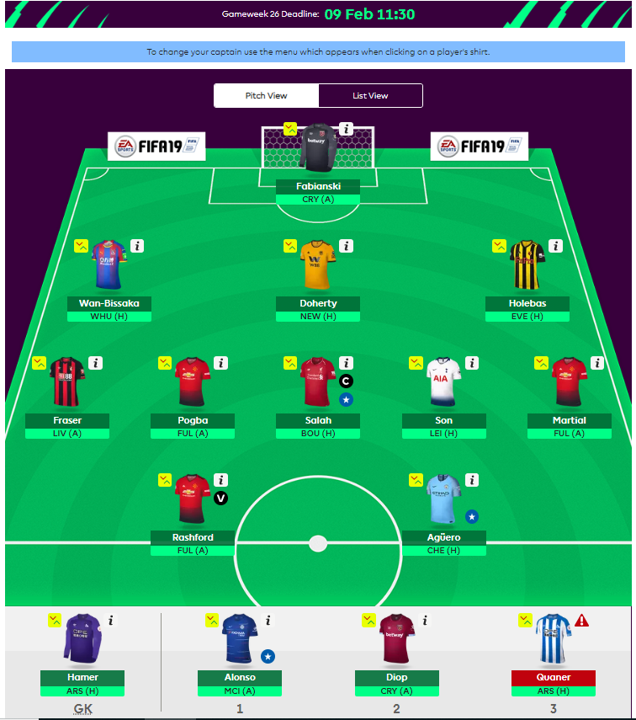 After this double gameweek from hell, we could not transfer Sane out quick enough, but the idea to take a -4 hit was tempting, looking over at our Zero-to-Still-Zero Anthony Martial. At this moment, and following my criticism of Martial in the above, I suggested for the second time this year that the team could bring in Paul Pogba. After initial confusion as to how and why I had been allowed to speak, they pondered Pogba for themselves, and decided it was good. However, as you can see, Martial lives to fight (or to not play) another day. With their transfer-fingers itching nonetheless, the team’s attentions turned to Richarlison, who has flat-lined in recent weeks. Against his former club, Watford, he is just as likely to score a brace as get sent off for a headbutt in the 12th minute. He was a risk either way, and Everton’s poor form means he is an easy candidate to cut as another blank-gameweeker. There were some concerns in tripling up on Manchester United, however there are few teams you’d rather they faced with three players in your FPL side than Premier League goal-sponges Fulham. The team consider Martial a bit of a differential here, as everyone has Rashford and Pogba. So when Martial scores 0 points, we will be just one of 5.5% of teams to benefit from them.